It's raining here in santa barbara where we now are parked. This has resulted in us spending a greater amount of time indoors, curled up upon the window seat, watching the wood fire, sipping tea, practicing our insturments, reading, and contemplating things. It is actually quite nice. I love the rain and colder weather. I find these conditions to be most inspiring and creative of all for me. I enjoy snow especially. To me a winter and spring without snow and rain is like summer without the sun. I need this weather and ocasional times of hibernation, to help me incubate new idea's and create new works. We moved from isla Vista to Santa Barbara (just a few miles south) beacause we are working a new initiative that is only applicable to those registered within santa Barbara city, proper. 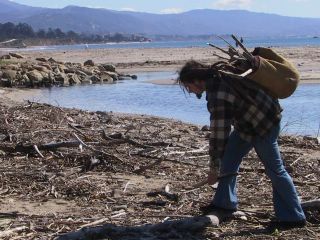 It's another wonderful one....a marijuana initiative that would make posseion in santa Barbara a lower priority offense. Santa barbara, we are finding, is another little bastion for liberalism in southern california, as is Isla Vista. The people are amazingly kind and pleasant. In the State Street area, which we are parked near, the streets are full of musicians, street performers and travlers. In the day we park for free, along with various other free spirited nomads in a day parking area right on the beach !! We can stay in this spot pretty much all day until 2am, then we must find a place for the night, until 5am...then it's back to the beach parking. I would much rather be in a forest or some other remote location, but work brings us into the city for now. As far as city living goes though, it is nice being right on the beach. State street, where we are working, is only a few blocks away, and we can ride on our bikes to it. There is even free fire wood for our wood stove! The beach where we are parked is covered with bone dry pieces of beautiful, sun bleached driftwoods, perfect for the stove. Before we leave I plan on filling our wood box full of it, and keeping some as new percehs for the birds, as well as decoration. While I am at it, I will get a trash bag and clean up some of the garbage lying about...a nice way to give back. 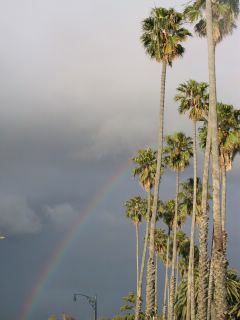 Life is good here in Santa Barbara California ! Lately, we have been receiving a large number of both public as well as private emails stateing how wonderful our lives seem and how unhappy some say they are with their own lives and liveing situations, and how lucky we are. I am concerened that people may be getting the wrong idea. Although our lives may seem idylic and even a bit romantic to some, the reality is that it is not always so. We have our own unique dramas, challenges, issues and karma to work through, just like everyone else. The unpredictablity of our income is a BIG one. Ocasionaly we have had to borrow money and/or rely on the kindness of others during a down time financially. However, when we are in a position to help others we try to do so, the best we can, thereby passing the good energy on. I know, it sounds very idealistic. However, it should be quite obvious by now that Moss and I are both prone to idealism. To be honest though, I sometimes really enjoy the unpredictability of it all.I seem to thrive on it in fact. You see, although it doesnt seem so, life is really lived momment by momment. Everything changes and nothing is permanent. People, situations, everything, is in a constant state of flux. When a person realizes this, there is a tendecy to feel, at first, despair and sense of pointlessness to it all. This can cause some to give it all up, live in a cave and become a renunciate, hindu sadhu, budhist or christian monk, hari krisha disciple...most spiritual paths have their equivalent. Others however, like myself, chose simply to make a mental note of all this and try to enjoy life, yet remain unatcahed and ever aware of the transient nature of it all. I try to experience every secound as magikal and wonderous as the next ( you remember that feeling as a child, dont you ? ). Moss and Gaia on the beach in Isla Vista. 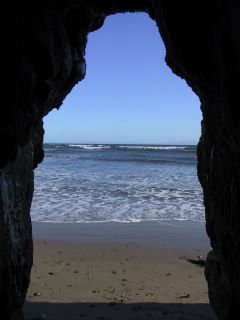 The view from inside a cave, on the beach..
Moss snaped this pic of me engrosed in dulcimer practice. Many people have been asking "what is that "thing" on my head, and why do I always wear it ?" 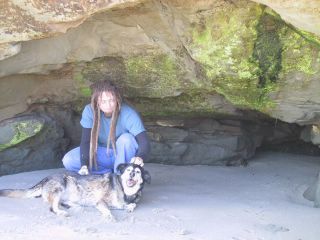 To answer the question, I am attempting to grow my dreadlocks back after cutting them off a few years ago. The bandana, or a hat, is used to help the hair matt and lock together. I really do prefer to keep my hair very short..but I am finding the cost and maintenence involved in maintaining short hair to be quite annoying. 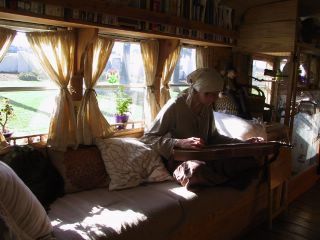 Especially when compared to the many years( all of my adult life)of haveing dreads, which require virtually no maintenence to deal with..besides a vigorous shampooing once a week..
We met a very nice fellow with two young boys that live and travel full time in this gorgeous bus. Moss and I have been thinking real hard about adding a small secound story as well..though we are not real shure weather we would do a vw top (certainly the easiest mathod) or a wooden or metal roof raise.. 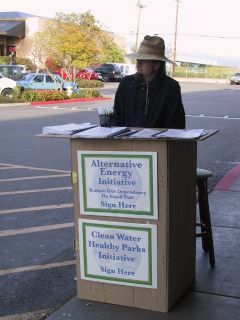 Here we are in the parking lot of a shopping center in Isla Vista C.A . 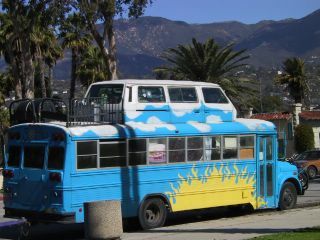 Isla Vista is a small college (UCSB) town very close to Santa Barbara. This whole area seems to be an oasis of kindness and unabashed liberalism in the heart of a very conservative southern california. We are working a few really, really excellent initiatives this year that we are SO excited about. I mean,these are the kind of initiatives that we are just more than happy to work on and be a part of under any circumstances. In previous years this has not been the case. The initiatives wanting to get on the ballot have been ones that we would not want ever want to see on the ballot, hence and we did not work them. Whenthis happens we have to rely on other ways to earn a wage.... artwork, CD sales, odd jobs, bartering, luck,.. Recently, we were in the town of Valencia and people were just so nasty. The Target called the cops twice within two months. This is something we have to deal with every season though, at least three or four times. You see most people, including the officers, do not realize that our right to gather signatures is a matter of free speech, protected by various state constitutions. The law allows us to stand outside the door of any store open to the public, on their property, set up a table, and ask for signatures on proposed state initiatives. The intresting thing is that, we do not need their permission. This very often causes problems as the stores generally do not want us there. Further, the managers of the stores (usually a Wallmart, Target or other large chain) are ill informed in regaurds to the law. They try everything, lies, intimidation, to get us to leave. In many cases it seems they actually know what the law is but are purposefully told from higher ups to deny it, in hopes that we will be intimidated. We have always stood our ground though, calmly explaining that we are allowed by law to be there (citing various court cases and codes) and that we will be nice and be certain to not block the doorway. Ocasionaly they will have been through it before with other petitioners, realize that we have called their bluff, and leave us be.Too often though it culminates in the manager calling the cops, and then we have to go through this little dance with managers, cops and sometimes the city attorney. If we are lucky, about 75% of the time, the officers are familar with this obscure law, and will inform the managers that we are well with in our rights.The difficulty arises when the officers are either unfamilar with the law, do not believe us, or are too obstinate to look into into it further. 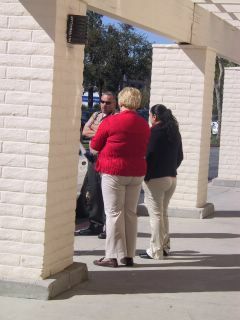 They try everything, essentially a more agressive version of what the store managers do, to get us to leave. Often they form what Moss and I have come to term the "huddle", a gathering of several store managers and two or three cops, brainstorming every conceivable way to bust us. They threaten repeatedly to arrest us, they insult, lie and intimidate us....all the special techniques reserved for use on thieves, rapists, murderes and other criminals. The only difference is, we are none of those things and the law really is on our side in this case. Eventually the officer wonders why it is they have failed to shake our confidence and why we are so willing to go to jail over the issue. At this point the coyly call the city attorney, are told that we are within the law, and we are inevitably unhandcuffed to continue our work. The funniest thing is watching the smug look on the astonished managers face disapear as they are told we have every right to be there. Only a few times have we been actually placed in the back of the car in handcuffs, and never have we been officially "read our rights". Others have however and hefty lawsuits were settled against both Walmart and Target for obstructing free speech. If someone ever makes the mistake of actually fully arresting us, we have the names and numbers of lawyers experienced in this area ready to go. 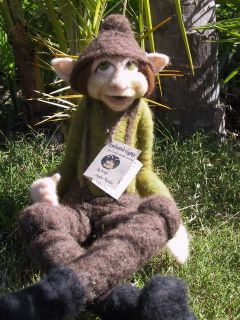 We do try to avoid this at all costs however..
We should be done petitioning in May or June and hopefully will have made enough, combined with our other endevours (Moss's c.d sales and my wool sculptures) to get us through the rest of the year. We may even have enough to finish the water sytem ! Then we can focus the remainder of the year on our art and music. Yesterday, after getting our computer back from the repair shop, we signed up for Verizons National Access, wireless internet program. We now are able to access the internet inside the bus as we travel !! Previously we relied only on our wifi card and the ocasional free hot spot to get on the net. Now we just insert this little card into a slot on the side of the computer, pay verizon 60 bucks a month, and we can get on the net for unlimted amounts of time at broadband speeds, wherever the signal can be reached ! 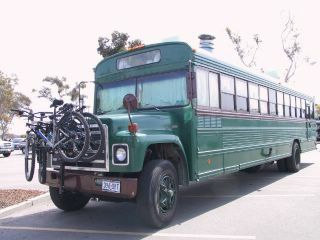 We were also able to finally find a good bike rack for our bikes and a welder to weld it on the front of the bus for us. We are thrilled to have found him, as we have been looking quite awhile now for someone to weld us some storage bays under the bus, extend our battery box, make a new veggie oil tank and weld some racks on top. The officers and a few Target managers form what we call the "huddle"..or "what can we possibly do to bust them", brainstorming session. Moss gathering signatures outside the K Mart..